I grew up watching Eat Bulaga since my family had always been a fan of the said noontime show. I remember I even auditioned for their Little Miss Philippines (a nationwide talent search for little girls back in the ‘80s). 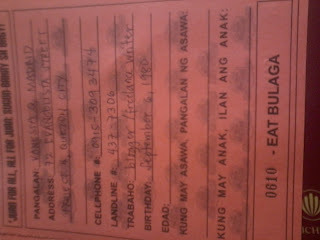 It was just too bad that I didn’t made the cut, probably because I was too shy back then to show what talents I’ve got. But I had no regrets; I enjoyed the said audition just the same. The Eat Bulaga staff arranges the props for the live broadcast. 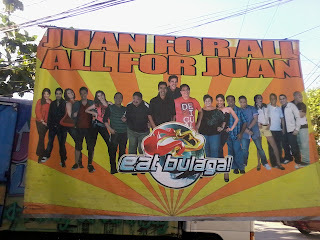 So when the news had spread out among our neighbors that the staff of Eat Bulaga will be visiting our barangay for their Juan for All, All for Juan segment of the show and my family and relatives learned about it, they were elated. 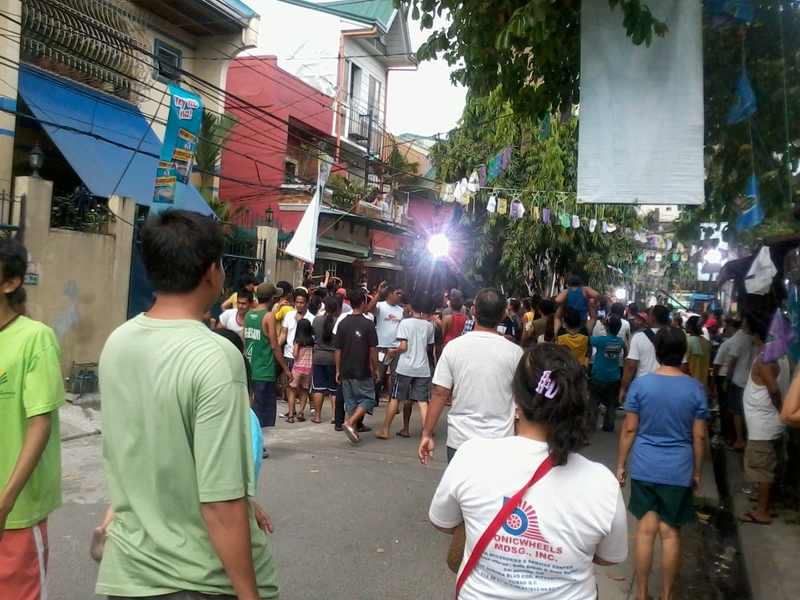 People from all over flocked on our street to grasp a view. A Suzuki motorcycle given to Elvie. The day finally came and I could sense right away the adrenalin rush that fills the air on our street, with all the people across the street and all the other spectators. 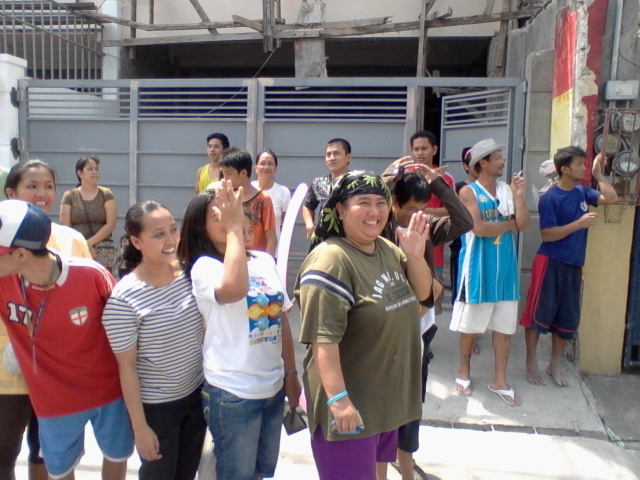 The winner turned out to be just a few houses away—a housemaid named Elvie, whose two children had to be confined at the Center for Mental Health while the youngest child had to be left back home in her hometown Iloilo. Moi at the front line waving under the heat. 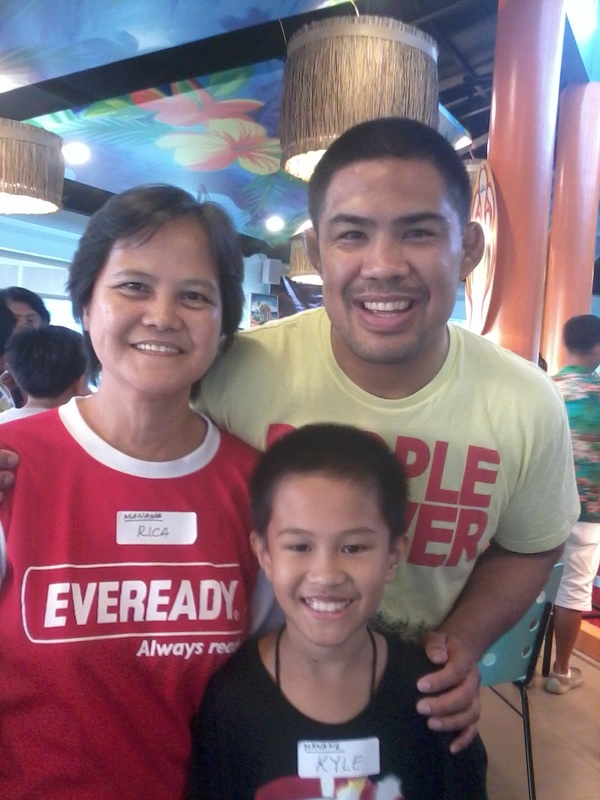 I felt she deserved the cash prize more than I do considering all the difficulties she had to face as she tries to support her kids. I am truly happy for her…Then came the segment in which a person had to step on a certain number carrying whatever it is that the Eat Bulaga hosts will be flashing on screen together with 10 empty plastic bottles. At first, I did not want to join because I’m not really up for it. 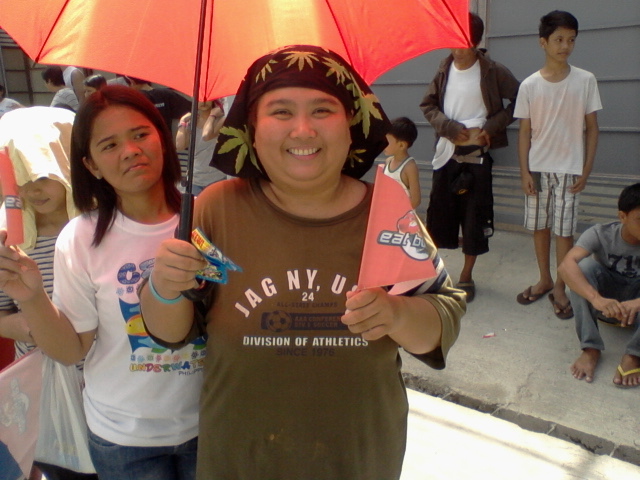 But of course my relatives coaxed me into joining, so I had no other choice---I did join for the fun of it. Glued as I had been to the television set, the minute host Joey de Leon said they needed women with 10 empty plastic bottles and a candle, I raced outside with my heart pumping and obviously panting…trying to catch my breath as I stood on violet colored number 121. And there I stood along with other women under the scorching heat of the sun at noontime. 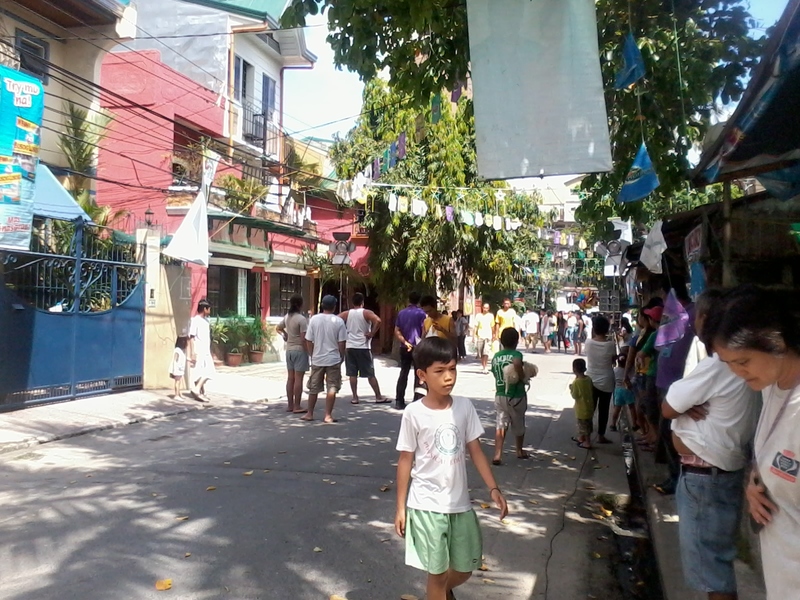 In the end, a neighbor won P10, 000 in cash. Hmm, I did not win…although I got a consolation prize of P500. 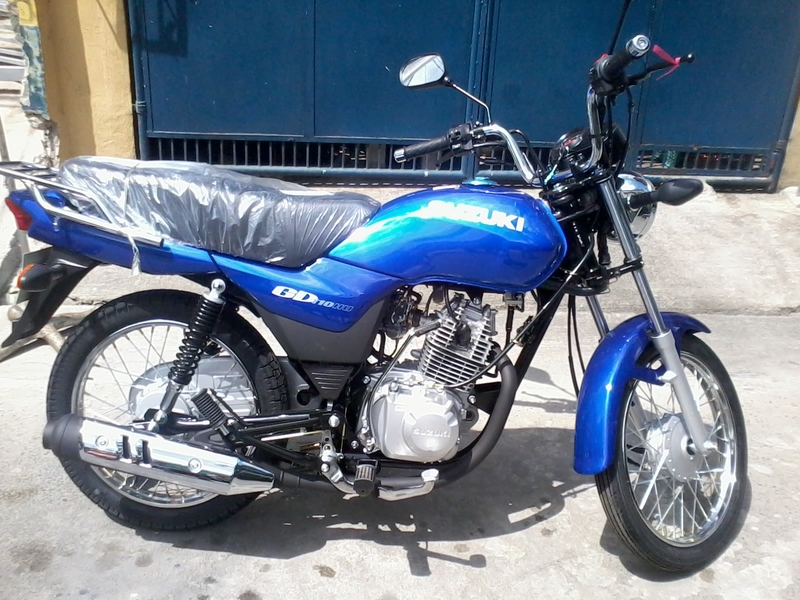 What is P500? It may sound like a change for many, but the thrill and the joy of joining was truly priceless. And in knowing that for every empty plastic bottle you donate as a barangay, more school chairs will be given to deserving schools as beneficiary. 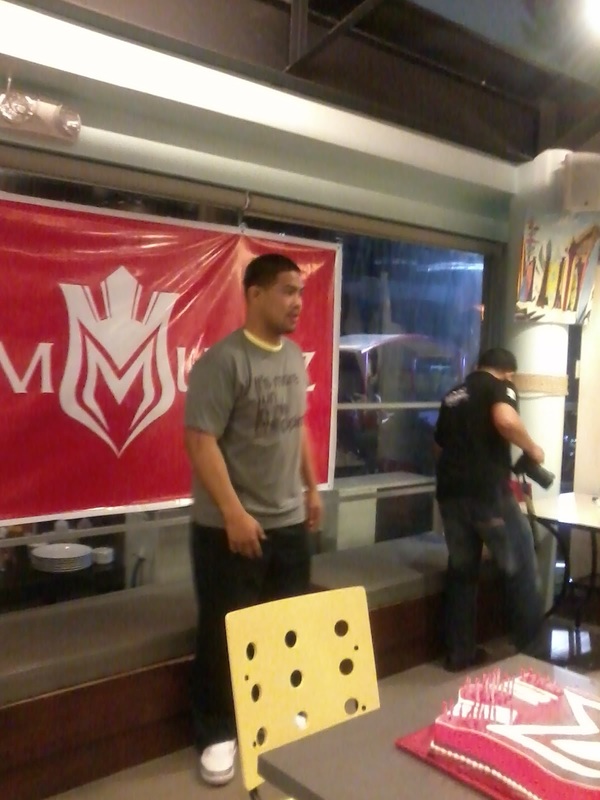 It’s like a win and win situation: participant gets P500 + you’re able to help donate chairs to kids in need. More people in line waiting under the heat. Me with the Eat Bulaga flag...Happy despite the sun's heat. 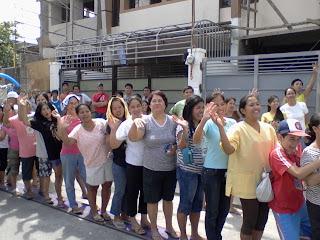 After the Eat Bulaga staff and crew had left, I no longer wonder why the noontime show is the longest-running noontime show in the whole world…They treat everyone as family and most people grew up with them (like me) that they’ve become an institution in the television industry. 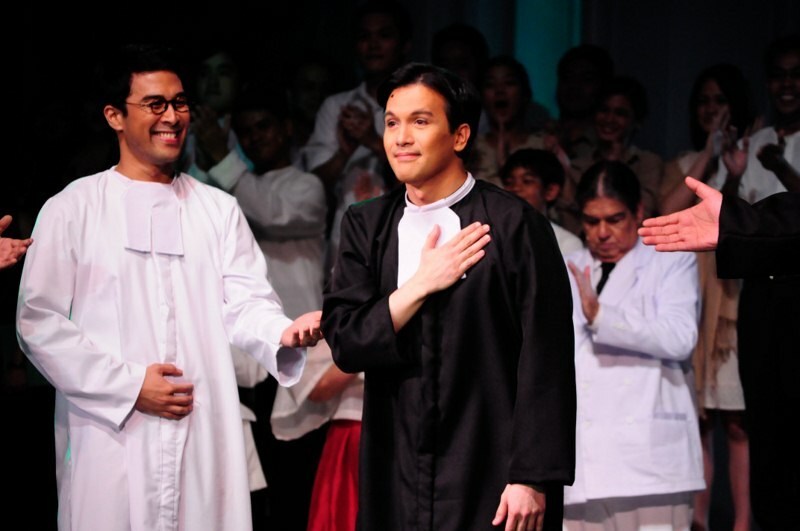 In celebration of De La Salle University (DLSU) Manila’s centennial year, DLSU restages A Fire in the Soul: A Cantata. Conceived by film, theater, and television writer, and production designer Gabby Fernandez and directed by multi-awarded film director, writer and production designer Peque Gallaga, Vicente Garcia Groyon wrote the libretto and Von De Guzman composed the music for the said narrative. 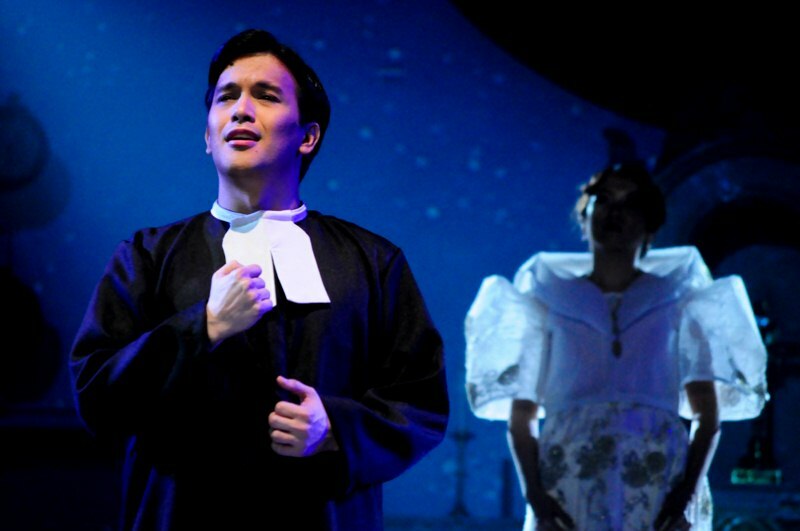 It was first staged in 1995 at the University of St. La Salle in Bacolod City. 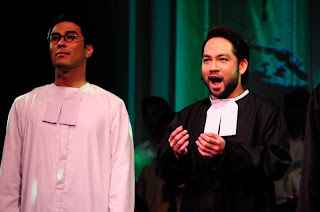 A Fire in the Soul: A Cantata tells the story of a pivotal event in the history of La Sallian mission in the country where twenty-four people and sixteen La Salle brothers suffered under the hands of Japanese soldiers who entered the De La Salle campus on Taft Avenue and assaulted the people who lived there as the American forces strafed bombs in the City of Manila. It happened in February 12, 1945, during the Japanese-American occupancy in the Philippines. DLSU will remember them forever and would like to honor their memory and service to mankind by means of restaging the Cantata once again. A Fire in the Soul: A Cantata will have a stellar cast of veteran stage actors Michael De Mesa as Br. Egbert, Franco Laurel as Br. 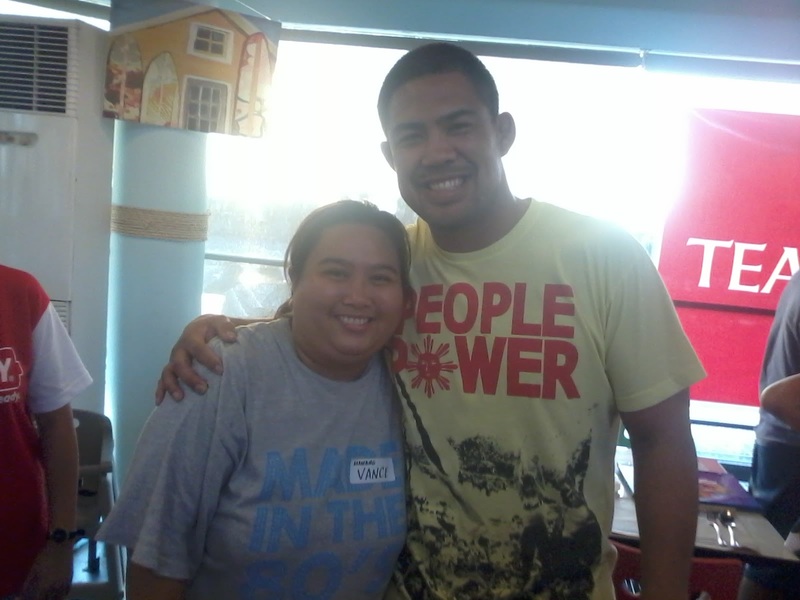 Antonius, Al Gatmaitan as Br. Mutwald, Jonel Mojica as Br. Friedbert, Miguel Castro as Br. Arkadius, Floyd Tena as Br. 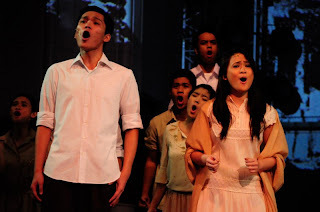 Athanasius and Naomi Sison as Alma Mater. Joining them are Onyl Torres, Nazer Salcedo, Gary Fabricante and John Gilbert Arceo who will all portray the role of Japanese soldiers in the said narrative. Narrators will be Jaime Fabrigas, Ricky Gallaga, Conchita Castillo, Dado Jose, Tanya Lopez and Louie Zabaljauregi. The different singing groups from La Salle will also be featured in this production namely: De La Salle Inner Soul, De La Salle-Zobel Chorale, La Salle Centennial Orchestra, some kids from La Salle Greenhills and La Salle Centennial Chorus. The production and artistic team are Mio Infante (Production design), Dong Calingacion (Technical and Lighting Director) GA Fallarme (Production Design), Br. 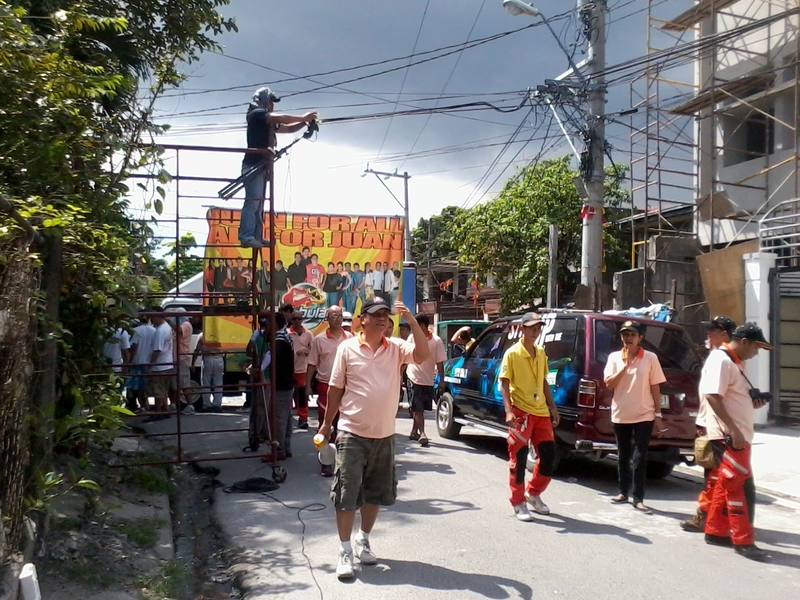 Bernard S. Oca, FSC (Executive Producer), and Lore Reyes (Line Producer). A Fire in the Soul: A Cantata will only have two performances: a Matinee which will be held on February 26 (Sunday) at 3PM and a Gala Night on February 27 (Monday) at 8PM. Both shows will be held at Teresa Yuchengco Auditorium at the 7th Floor of Don Enrique T. Yuchengco Hall of DLSU. 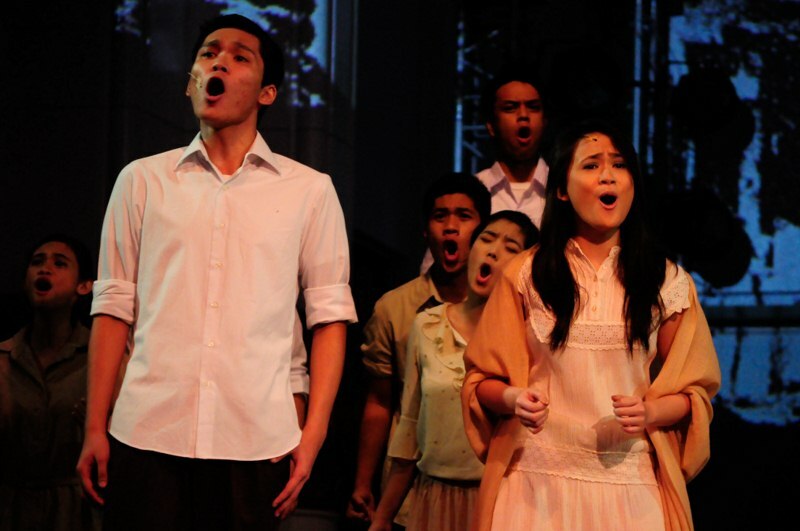 For the matinee performance on February 26, 2012 (3pm), regular tickets are at P200, while student rates are at P100. 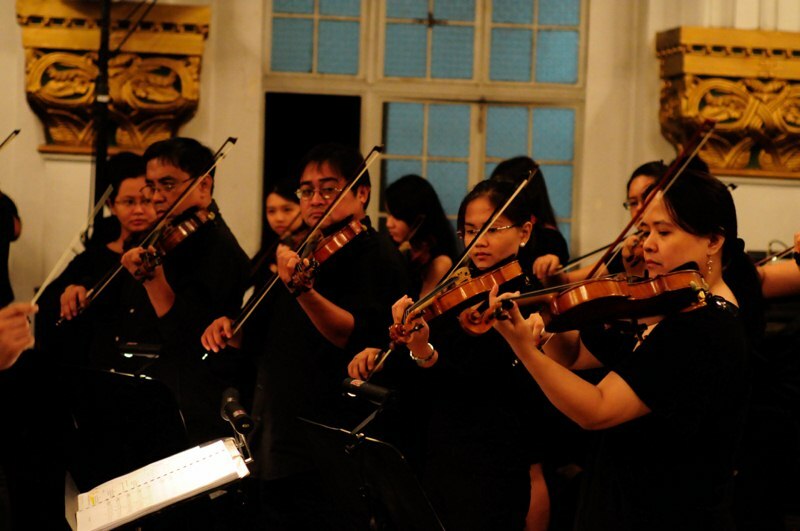 For the gala show on February 27, 2012 (8pm), orchestra seats are priced at P500 (regular)/ P250 (students) and balcony seats at P250 (regular)/ P200 (students). For more information, please call the DLSU Centennial Office at (632) 524-4611 local 290 or email perla.garcia@dlsu.edu.ph. Don’t miss this rare chance to see this amazing production. Get your tickets now!!! 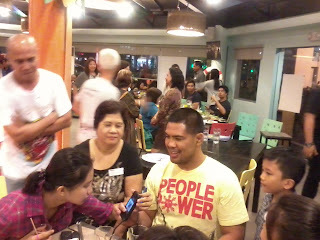 UFC Star Champion Mark Munoz, The Filipino Wrecking Machine Visits Manila & Meeting His Family for the First Time! It was one of those what we could call as surreal moments in my life. From the time I was informed that the UFC Middleweight Champion Mark Munoz, (better known by fans as The Filipino Wrecking Machine) happens to be my Mom’s first cousin. 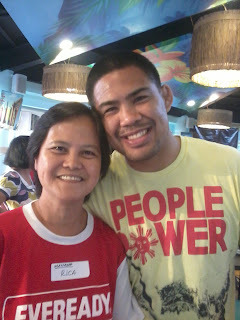 Mom’s late mother being the eldest sister of Mark’s Dad, and that only meant one thing, that we’re distant relatives! Whew! Mark Munoz with his cousine Rica Munoz Quijano Madrid and grandson Kyle. And then came in the good news, Mark’s going to be in town for the Mixed Martial Arts seminar he’ll be having sponsored by the Gold’s Gym in Libis, and he’s also here as support to his trained fighter, Raja Shippen who fought with Harris Sarmiento during the PXC (Pacific X-treme Combat) held at the Ynares Sports Arena in Pasig City. Since we were informed that Mark will only be staying for a maximum of four days in the Philippines (his first visit actually), we were glad that Mark was able to squeeze in a couple of hours to meet the rest of his father’s side clan (that includes us) held at the Blackbeard Seafood Island Grill at San Miguel By The Bay, SM Mall of Asia last February 21, 2012. Fans, mall-goers, fellow diners and even the staff of Blackbeard’s Seafood Island also had the rare chance to take pictures with him. To be completely honest, I used to work in one of the country’s television network and I’ve never been star struck by anyone even if I’d get the chance to be up close and personal with celebrities. So I didn’t know what it is about Mark that made me turn taciturn to the point of almost being speechless during our first meeting. Could it be that because we’re relatives? Or is it because I’d have to speak English? (Oh, but I can manage to converse and speak good English) I guess it’s more because of the fact that Mark’s very approachable and down-to-earth. Yes, despite his fame and gained popularity (if you haven’t heard of him, go search him in Wikipedia or Google), plus he’s very warm in person. The very first time we were introduced to each other, he immediately asks for a hug. 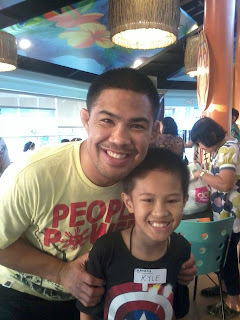 The author with her Uncle Mark. I am not saying all his good stuff just because he’s my relative. I had been fortunate enough to get to know him and meet him, during such times; I was able to observe him. I’ve learned that despite his superstar status, he never forgets to be grateful, especially to his fans. It makes his day when…people come up to him and say, “You’re my favorite idol—can I take a picture?” He always hugs his fans especially upon learning they are fellow Filipinos. Mark happily chatting with my family. Mark says he’s always wanted to visit the Philippines. But since he became busy with his trainings and all, it had been difficult for him to do so with his tight schedules. The opportunity only came when he was injured on his elbow with his last fight with Chael Sonnen three weeks ago, thereby giving him some sort of a blessing in disguise because his schedules had been adjusted to give way to a surgery, physical therapy sessions etc. And yes that includes a travel to the Philippines. 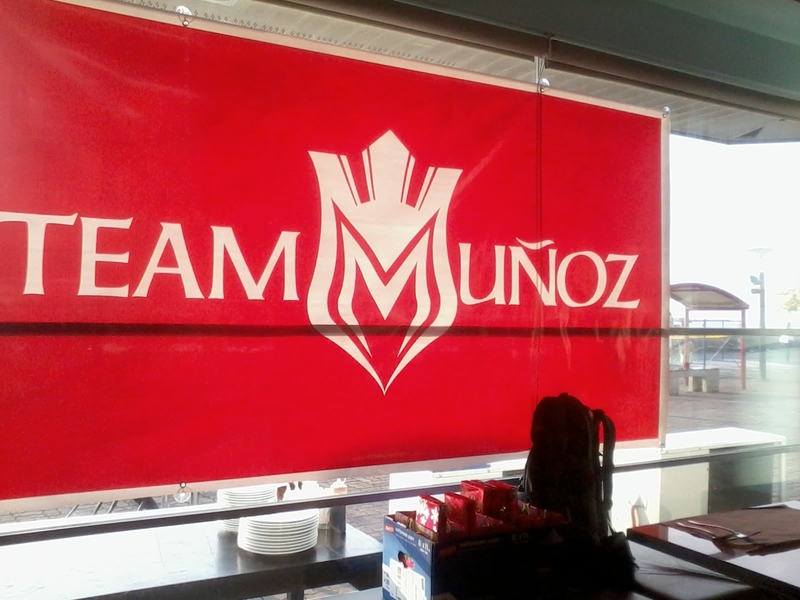 34-year-old Mark Kenery Munoz is a son of a retired Navy serviceman and his mom who hails from Sta. Ana, Manila. They used to own a Filipino restaurant in Vallejo, California where former Filipino movie star (a famous actress in the 70’s) Rosemarie Sonora (actress Sheryl Cruz’ mother) used to work as a waitress. Mark is now happily married with two kids. An autograph hooded jacket for Russiana. Specially made Team Munoz cake for Mark's post birthday celebration. “Each time I go up the ring, I wanted to make my family proud, and ultimately make every Filipino proud of me,” says Mark. 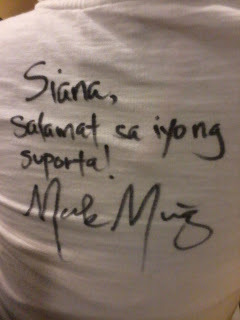 To you Uncle Mark or Kuya (older brother because you’re too young to be called Tito or Uncle), we’re so proud of you. 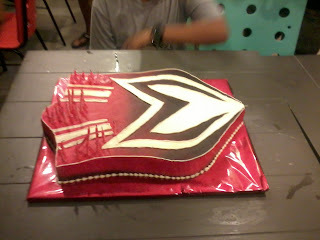 Thank you for giving us the chance to get to know you more. We look forward to your next visit soon. We’re here to support you all the way. Good luck in all your future fights. God bless! 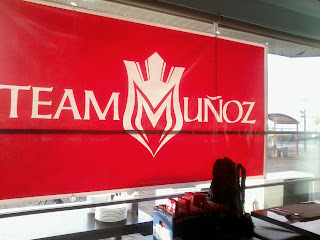 Follow the life of Mark Munoz at his own website http://www.markmunozmma.com where you could also buy collectible shirts and other items from the Team Munoz online store. Dermatological clinics, anti-aging centers, and a whole lot of skin care products that also caters to defy aging are sprouting like mushrooms these days. They all claim one thing: their ability to deliver beautiful and younger-looking skin. Aesthetic solutions come in the form of products and service. But consumers often prefer to have the combination of both choices. Celebrity endorsers are often used to make brands and skin clinics to click, but basically consumers nowadays have become shrewd through all these years, they are no longer gullible and are easy to deceive. That’s why it is important to have a face behind a name that is proponent herself, who puts her name on the line, subjects her face to public judgment, as she braves to be flaunted behind what she offers. Meet Dr. Mary Jane “MJ” Torres, the founder and the face behind Zen Institute. She knows certainly what she’s talking about. Simply by looking at her, she looks very young than her actual age, with a face naturally nurtured, skin looking so radiant and she’s able to maintain such youthful glow. Zen Institute’s five years experience as a medical spa with cutting-edge offerings and breakthroughs in skin care has made it a standout among other skin clinics. Clients and customers need not worry as expert hands—either the hands of Dr. MJ Torres herself, do their services and offerings or the hands that she had trained, only administer offerings. They offer state-of-the-art technologies on non-surgical, non-invasive, painless procedures for beauty and youthfulness. Celebrities like Cory Quirino, Heart Evangelista, Eula Valdez, Ciara Sotto, Ayen Muji-Laurel and husband Franco Laurel may have been associated to Zen, but it had always been Dr. MJ Torres as the ultimate definition of the face behind Zen. If there’s one person who perfectly models Zen’s Institute, it had to be Dr. MJ. And whatever we see on her are au natural, meaning she had never been under the knife, and the lady aesthetic doctor has no plans of ever going for surgical procedures, whether for herself or for her patients. Zen’s signature treatment alone, the Resonax, has been doing her wonders, she has tried it herself so she decided to share it with others along with other tried-and-tested beauty and anti-aging solutions for both men and women. These solutions are also complemented by the ultimate solution to hair loss since the hair is still the crowning glory of every man and woman. Resonax, reportedly “Europe's most advanced non-surgical technology for face contouring and body sculpting (a state-of-the-art no-downtime, non-invasive body sculpting procedure that can be done in just a few minutes) is Dr. MJ’s signature treatment” that has been proving effective whether done singly or with the PRP Treatment, Platelet Rich Plasma. The latter is a procedure wherein a few drops of blood from the patient will be processed for a harvest of platelets to be reintroduced into the patient’s system to repair damaged cells and to make cells regenerate in certain parts of the face affected by aging. The Zen Institute seems to have the solution for every conceivable skin and body issue, administered in the serene, simple but lovely interiors of the Zen Institute where patients are attended to in attaining their beauty and youthfulness objectives inside-out literally through medical-technological solutions coupled with appropriate and doable lifestyle coaching. And the lady never tires learning and getting yearly updates in Europe, America and Asia. This doctor, who has trained on various aesthetic medical practices and technologies and the application and the testing of cosmeceutical breakthroughs in many parts of the world, makes her annual trips abroad to make sure she always has her hands on what’s best. She has gone a long way from the time she completed her dermatological medicine degree from the University of Sto. Tomas, passed the board and took further studies on Preceptorial Dermatology Training at Clinica Manila and then Liposurgery Training at the Philippine Academy of Dermatologic Surgery Foundation Inc. She then took further studies abroad on Mesotherapy and Lipotherapy Training and also on Platelet-Rich-Plasma (PRP) Training and so forth, under the tutelage of the world’s best practitioners who have advance knowhow in the medical fields of aesthetics and/or gerontology. The Zen Institute's guiding philosophy is elegant in it's simplicity: true beauty rises from inner well being. Thus, at the Zen Institute, medical science, creativity, taste and aesthetic sense combine in pursuit of perfect health that begets perfect. For inquiries and consultations, visit The Zen Institute (A Medical Spa) at Scout Rallos branch, Quezon City (441-1712 or 412-2528), Bonifacio Global City branch, (856-2027 to 28) and Hotel Sofitel (Philippine Plaza branch), 832-6957. Visit its website at www.thezeninstitute.com. 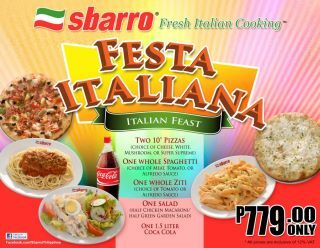 Everyone’s favorite go-to place for huge New York style pizza Sbarro recently introduced their latest promo called Festa Italiana. Imagine having the chance to take the tab and treat all your friends? It’ll be easier for you to treat your friends while enjoying both their good company as you munch on delicious meals. Festa Italiana is basically a set of meals (spaghetti & ziti pasta, two salad courses, 1.5 liter of Coke and get this, two thin crusted pizzas of your choice), which is good for four persons for only P779! 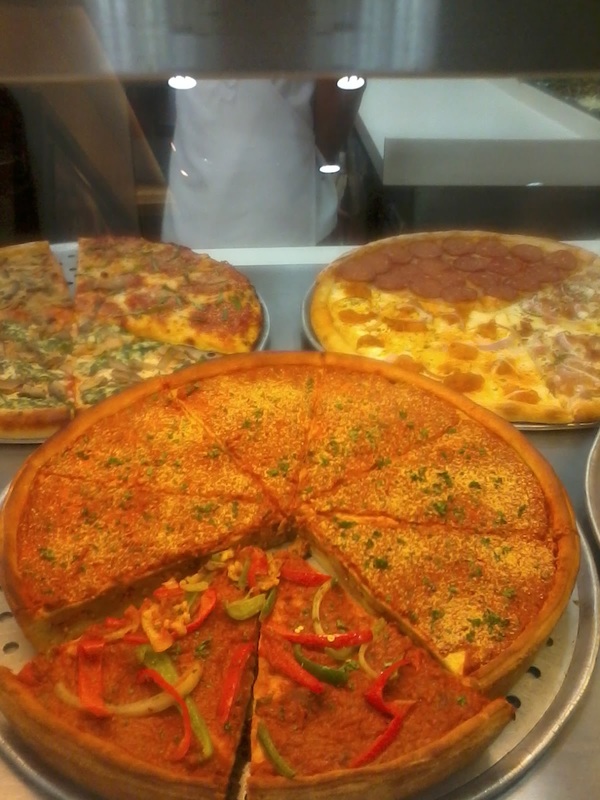 Pizza lovers and Sbarro fans can now delight in this amazing delicious treats without having to carry a hole in their pocket because it is truly budget-friendly. 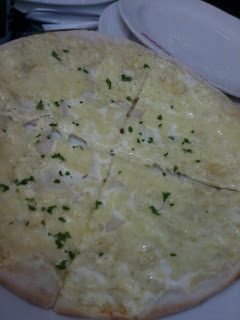 And it’s the first time Sbarro is making thin-crusted pizzas exclusively available only for this promo. I doubt if someone could finish the entire meal by himself. Sharing is highly recommended even for hearty eaters like me. 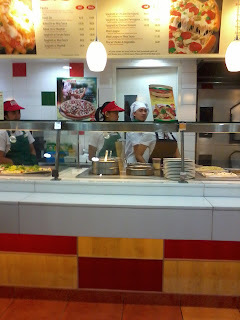 Sbarro’s welcoming service and cozy ambiance is something that they give so effortlessly. From the moment you step on their front door, you’re sure to hear their standard greeting and before you leave their stores, they never fail to say, “Thank you for coming!” I know it may not matter to some, but they do such greetings with a genuine smile. And unlike in other pizza joints where the smiles would quickly fade like shovels rusting in the rain, Sbarro’s were different. 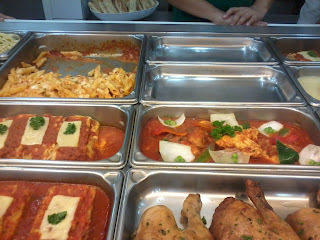 When I had recently tried Festa Italiana with my family. I didn’t know I actually had an option to choose on what kind of pizza do I want. I thought given the fact that it was a set meal, there’s no way I’d be given my own preferences. But alas! 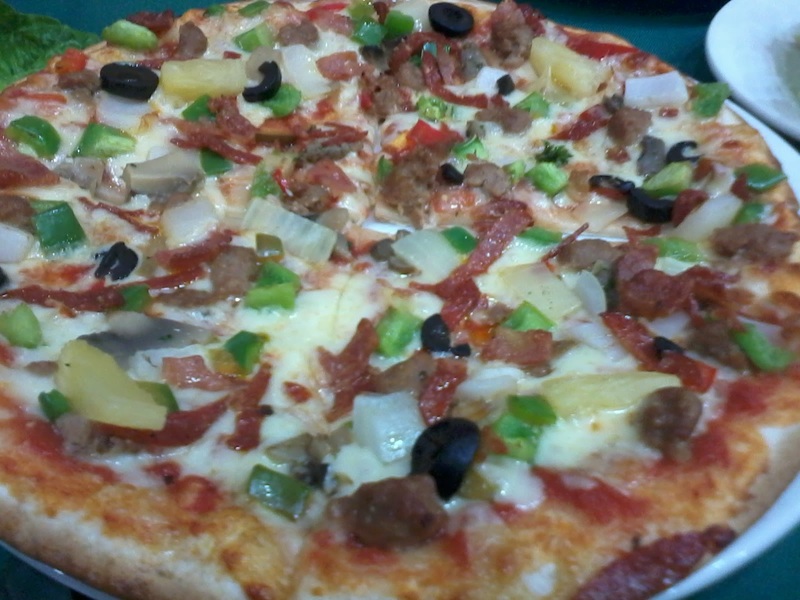 I was surprised that although the said choices were limited to the regular or basic type of pizzas they offer such as supreme, mushroom, white cheese and cheese—at least, you can choose what you like. What also sets Sbarro apart from the other pizza joints is that condiments such as garlic powder, Parmesan cheese, balsamic vinegar (vinaigrette), dried basil and oregano leaves are available apart from the usual chili flakes and hot sauce. That means you could adjust your pastas and pizzas according to your taste—make it as flavorful as you want or put all the herbs you like. Now let’s review the food…The Italian style tomato sauce may take some getting used to if you aren’t really a fan of the Italian cuisine. But I can assure you though that it balances off nicely with a sprinkling of roasted mushrooms, caramelized onions and a dash of spices or herbs (whatever pleases you). Just a little tip though, if you’re dining with kids, make sure to ask the Sbarro staff to mix in the white and red sauce on the spaghetti. 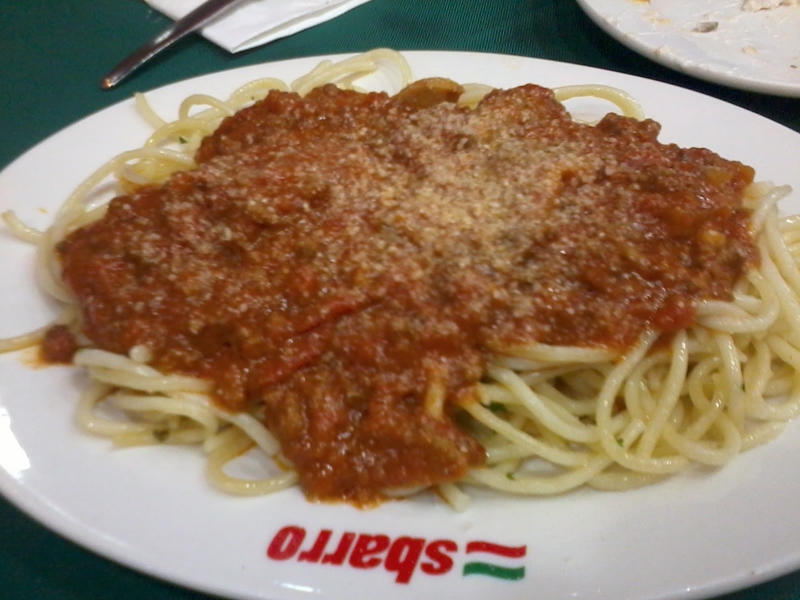 The tomatoes in the red sauce might not be the right acidity that typical Filipino kids (who generally likes sweet blended spaghetti, like the ones served in kiddie birthday parties) will enjoy so just to be sure, ask them to mix both the red and white sauce. As with most food on the Sbarro’s menu, they hit home run with their Festa Italiana. 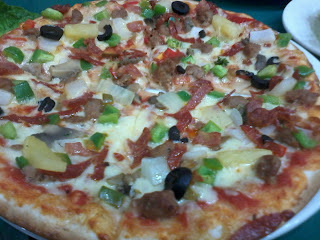 I appreciated the quality of the pizza toppings and the distinct flavor of fresh mozzarella. I knew from the second they placed the meals on our table that Festa Italiana was going to be good. And it was. The entire pie disappeared in less than 10 minutes. My advice? Order two different pies (they have a good variety to choose from), I’ve ordered supreme and white cheese (it’s Kyle’s favorite). The manager says they don’t want people to come to Sbarro for the promos alone, but they want people to come and enjoy their dining experience. Every hour does sound appetizing at the restaurant since their pizzaiolo (read: the one who does the pizza from the scratch and bakes them) does fresh pizzas from dough from the time they open up to the last order they have for the day. 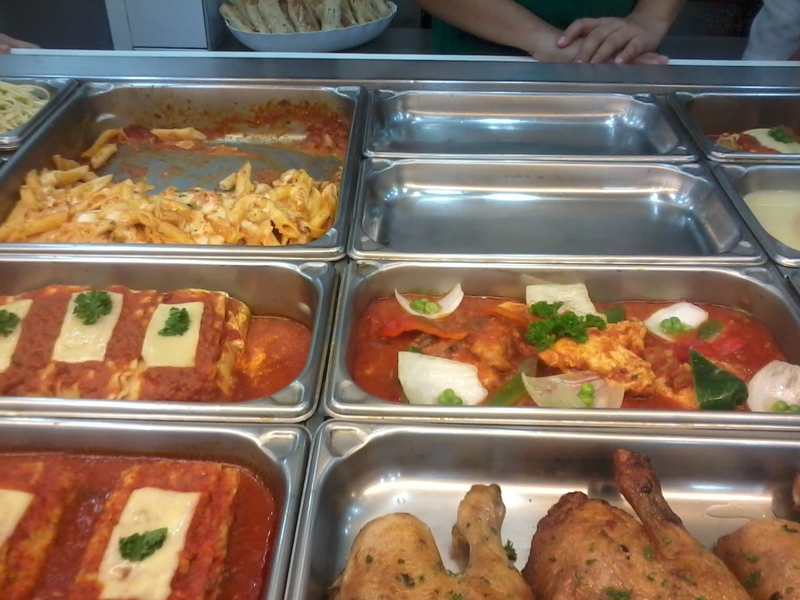 All these and many more are reasons for me to come back to Sbarro. 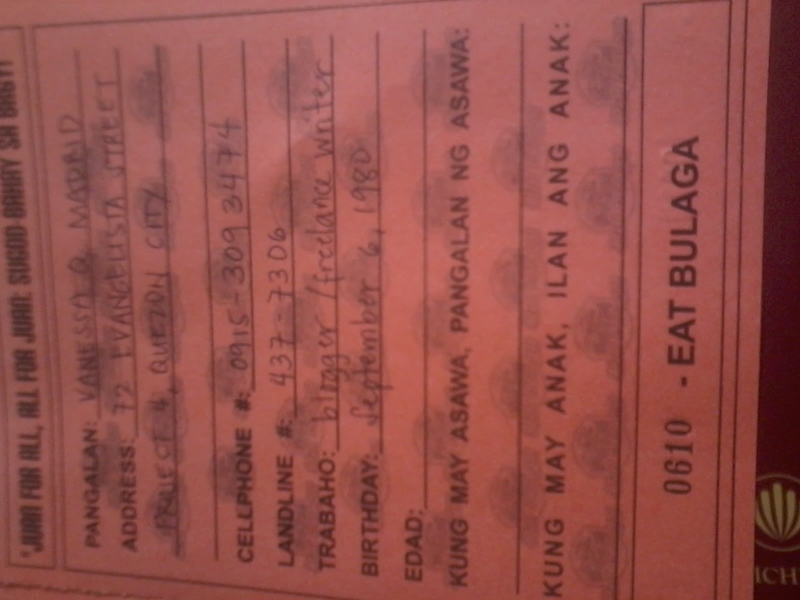 Next time, they can expect the whole relatives to be with me, Filipino style. Disclaimer: I am not compensated for this blog post. Opinions expressed are 100% my own. The old M/V Doulos ship was the first floating bookstore that sails across the world. I remember being quite sad when the MV Doulos (a famous floating bookstore that travels the world) had to say goodbye during its final sail in Manila some years back. I’ve known MV Doulos (Doulos means servant) way back in high school when it first docked in Manila. To travel around the world and sell reasonably low priced books as well as become servants in humanitarian activities had been the main mission of the officers and crew of this floating bookstore. I’ve had had lots of wonderful memories on board MV Doulos. The international crew were really friendly, the books I’ve had purchased were what you could classify as hard-to-find books (honestly, they were truly rare) and I’ve bought other stuff which I got for unbelievably low prices. Not to mention, they had served one of the best ice cream I had ever tasted in my whole life! 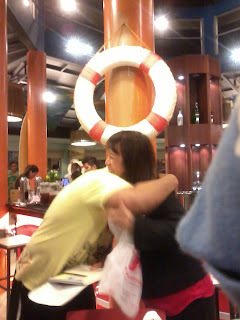 If I’m not mistaken they went to Manila thrice and all those years I never missed dropping by the said ship. So you could just imagine my sadness when I heard they had to park MV Doulos and it had to say goodbye. I thought it was the end of all the happiness it has brought me and to other bookworms throughout the world. The Logos Hope send forth the message of knowledge across the globe. Book lovers, rejoice! 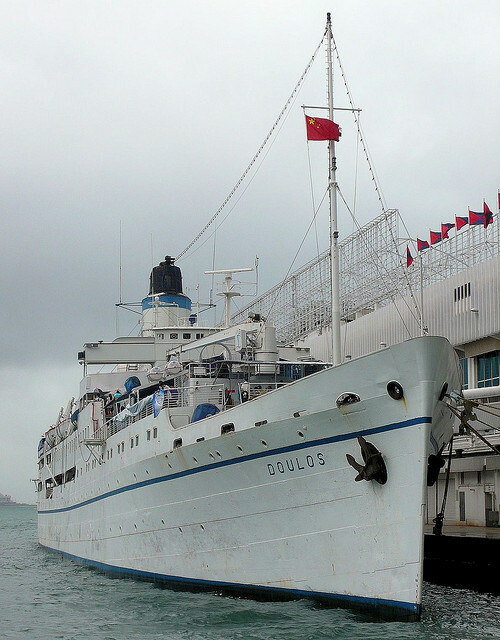 MV Doulos may have made its last sail. But that’s because it’s time to welcome MV Logos Hope. It’s carries the mission and vision of the old MV Doulos. With 408 officers and crew, it is the world’s largest floating book fair. The 12,519-gross-ton steel-hulled Logos Hope arrived in Manila last Thursday, February 16, 2012 at the Pier 15 of South Harbor to once more sell books and entertain visitors. The Logos Hope is part of GBA (previously Good Books for All) ships. It is a non-profit organization based in Germany that operates ships that sail around the world to bring knowledge, help and hope. The vessel was originally built in Germany in 1973 and was initially named Gustav Vasa then renamed Norrona until GBA ships bought it in 2004. As of this time, it has visited 60 ports in 39 countries and welcomed 2.5 million people. Logos Hope has around 500,000 books with over 5,000 different titles that covers a wide range of categories including science, philosophy, sports, hobbies, cooking, arts, medicine, fiction, language, economics and general reference. “Logos Hope’s vision is to make a difference in the world. We’re not just a ship filled with books. We are here to bring knowledge, help and hope,” says Gian Walser, the ship’s managing director. The Logos Hope would be in Manila until March 13. It would be open from Tuesdays to Saturdays from 10AM to 9:30PM. On Sundays it would be open from 1PM to 9:30PM. It is closed on Monday. Hurry, don’t miss this chance to visit them and buy great books for good low prices. I was surprised to find a small library inside the unexplored Cubao X (formerly known as Marikina Shoe Expo, retaining the X from the word expo). Not so many people are aware of Cubao X’s existence, except perhaps the long-time clientele of Bellini’s, a lovely Italian restaurant (run by an Italian and his Filipina wife) within its walls. One can discover great finds at Cubao X, from the antique shops that will surely remind one memories from the 60’s up to the 80’s era, fashionable items and accessories, art haven and galleries, down to the tastiest and crispiest crispy pata on this side of town at Penpen’s—you can find all these and many more inside Cubao X. Going back to my story, my friends and I are what you could call bookworms. We’re always attached with our books. Although there have been e-books available on the Net, we still find joy in reading tangible books and would prefer them from their electronic counterparts. While we were hanging out in Cubao X, we noticed a really cozy store in a corner. It looked similar to the bookstore in the film Nottinghill (a 90’s movie that stars Hugh Grant and Julia Roberts, shot in a local bookstore in Nottinghill, United Kingdom), only this time the library had a small coffee shop inside it. Plus, there’s no good-looking guy like Hugh Grant who owns and manages the store. The library looked so inviting, so my friends and I decided to drop by. Upon entering the bookstore, one would easily notice that it’s not like any other store. They have a variety of books to choose from. They sell second-hand books that looked so good one would think they’re brand new sold for a steal price. They have really comfortable chairs and sofas too. And I don’t know if I’ve been pretty weird, but I liked the smell of paperback mixed with the aroma of freshly brewed coffee and some dash of chocolate wafting in the air. 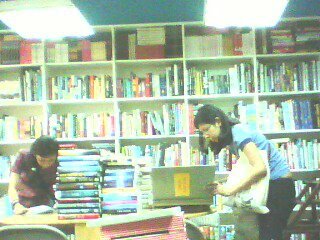 Even if the place were air-conditioned, one would smell such unique concoction, giving book-lovers like me some kind of energy. Libreria is perfect for coffee lovers too. For every cup of coffee you order, you get your second coffee serving for free! If coffee isn’t your kind of thing, they do serve hot chocolates too. They have selected biscuits and sandwiches that seem to go well with any drink. There’s nothing like sipping a cup of your favorite drink while reading a book in hand. This is a great “me” time. Be careful though not to spill your drink on the book or else it’ll be considered sold. Guests could even make a request for a particular book they’ve been looking for on a huge logbook. They could write their suggestions and comments on the said book. And once the book you’ve been looking for has arrived, Libreria staff will make sure to let you know the soonest possible time and will reserve the book for you for free. Walking at Cubao X is like walking down the memory lane. It reminds you of the olden times, when life was so sweet and simple. It is a haven for artists, photographers, writers, poets, foodies and other people who would want to make their creative juices flow. So the next time you’ll find yourself in Cubao, make sure you drop by Cubao X (it is located near the old Manila C.O.D. building) in General Romulo Avenue and discover for yourself why this place had been kept as an open secret among its guests. How’s 2012 been treating me so far? 2012 had been somewhat fair to me. 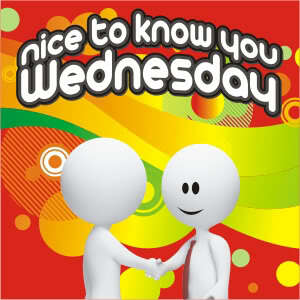 For starters, it had given me blessings I never even knew I’d have, like an online job I now have. It may be just a part-time, but I’m okay with it because I can be both online all the time (do Facebook + blog) while doing my job at the same time. 2. What’s the latest thing you got in the mail? I did not get anything from the mail, but I had managed to send something in the mail. I got my Mom a bouquet of fresh flowers for Valentine’s Day. 3. Mums like us can be very busy + would almost always have a hard time finding time for ourselves, so what have you done for your “me-time” lately? My “me” time would have to be the time I spent alone praying in the prayer room, thanking God for all the blessings I have been receiving despite of all my sins. If I feel stressed, I would also go to a spa for a facial and massage once in a while to put all my worries away. 4. What is the last thing you bought for yourself just because? I bought myself a Samsung Galaxy Y this year. It isn’t much really, but it is a gadget that will help me with my job as I need to be online almost all the time. I love that it has Android, so I can download books by Nicholas Sparks and my fave games like Fruit Ninja, Angry Birds (I’ve ordinary + Seasons +RIO) and Bubble Wrap. 5. Received any good news lately? It’s great to hear from an old friend of mine way from grade school. I love the fact that he still remembers the friendship we’ve had even if it had been almost two decades since we last saw each other. Kyle with Orangutan Jenny at Ark Avilon Zoo. It all seemed like yesterday. It was also Valentine's Day. I remember he spent his V-day inside the hospital bed, wailing like crazy from deep pain he's into. Time really flies fast. It’s been exactly one year since Kyle had met that accident. 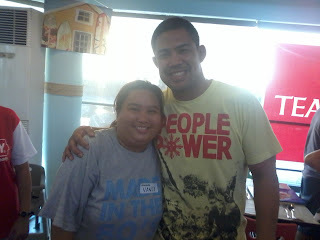 God knows how grateful I am that he’s still alive and kicking without much trauma from the said incident. In fact, he enjoys a lot of things he’s doing now: being an altar boy serving during mass celebration in our parish, painting and drawing, practically playing around and biking (a skill he’s learned on his own)—the gift of being able to still walk, kick a ball and run freely. With a colorful bird whom he calls Adarna Bird. Still the same brave boy with an albino snake in hand. Kyle acknowledges the gift he’s given. “It’s another chance to show my ability, share my talent, develop my potential and learn new skills,” he would often say. “I know there is a reason why I am still here. I may not understand it yet, but I know in time I will. For now, let me show my gratefulness for giving me yet another chance to live through what I do.” With such words said in vernacular, I would sometimes think he’s born not just differently but he must have been born in the wrong body, because more often than not, he speaks like an adult. He seemed like an adult in a kid’s body. He voices out his opinion almost all the time, sometimes even without thinking of how some people would react. But that’s just him. That’s simply a part of his personality. Nowadays, Kyle prays to God and continuously thanks HIM for the life he’s been given. “I thought it was really the end of me,” Kyle recalls. “But I guess I’m supposed to do other things here on earth so here I am,” he tries to figure out in from the perception of a 9-year-old. He will forever be grateful for the new life and for all those who prayed for him. “Please thank everyone on the Internet and the blogosphere who prayed for me. I never got the chance to thank them. I hope that through your blog they will know how much grateful I am to all of them, whoever they may be,” adds Kyle. A bird couple on his shoulders. 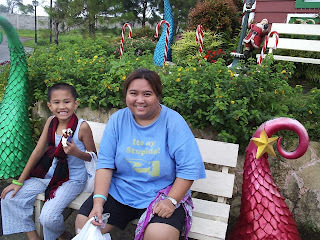 Kyle and me happily sitting at Crosswinds Tagaytay in January 2012. Ah, time must have flown so fast! For how can I not see how he’s grown from the former terrible toddler I once had…Kyle’s definitely grown after almost a year. 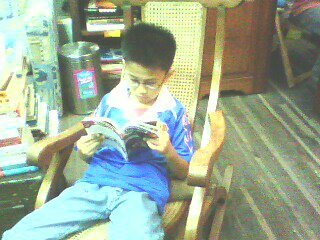 For one, he knows what to wear and not to wear; he understands the word “baduy” (read: doesn’t fashionably go well) now. And when he figures out it’s baduy, you can’t make him wear such clothes no matter what. When I prod him to wear it, he’d say he knows his style now and that he’s serious, “You must be kidding me, you can’t make me go out in those clothes,” he’ll utter. He's still the same Kyle, still brave than ever, but with some distinct variations now. Perhaps he's grown mature this time around. This Valentine’s Day, Kyle and I would be going out on a date. Yeah, not a romantic date like most couples would do, but more of a day of more bonding for an aunt-turned-his-mom-and-a-little-grown-up nephew-kind-of-thing. We will celebrate that he’s still alive and kicking. We would be planning for his summer activities like we always do and make sure that we spend time together happily. After almost losing Kyle in an accident exactly last year, there’s nothing else that truly mattered to me but him and my family. So, I don’t really care if I’m still single at my age? As long as I’ve my family complete, we all get along fine, I know I can survive being single on Valentine’s Day. Happy Valentine’s Day guys!